This unique program, based on the Burdenko Method using Fitness Intelligence, can provide lifelong benefits for your clients. Whether in a group fitness application or personal training, the Burdenko Water Walker program is versatile for all ages of clients and for all fitness levels. It is safe and has tremendous value in restoring health as well as in injury prevention. It maximizes time efficiency, makes exercising fun, is easy to remember, and mimics some sports movement. Great for personal training, group fitness, rehabilitation, and sport conditioning applications. Demonstrate proper assembly of the Burdenko Water Walkers. Demonstrate proper wear and safety tips for the Burdenko Water Walkers. Discuss the populations that could benefit from a general conditioning program with Burdenko Water Walkers. Describe and explain six essential qualities (balance, coordination, flexibility, endurance, speed, strength) to teach and develop through exercise with the Burdenko Water Walkers. Understand basic training tips and main principles: working with multiple directions, different speeds and starting positions for using the Burdenko Water Walkers. Describe and demonstrate six exercises for the six essential qualities with the Burdenko Water Walkers. Convey key points to aid clients in proper form and technique for each Burdenko Water Walker exercise. Explain the benefits and goals of each Burdenko Water Walker exercise. 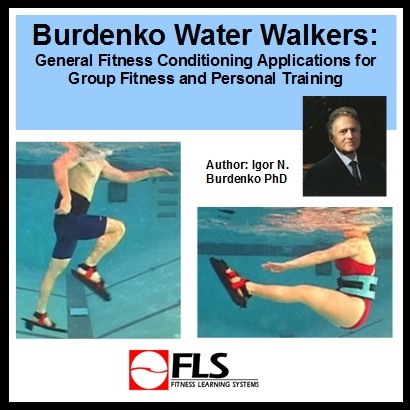 Construct safe and effective group or individual workouts for clients with the Burdenko Water Walkers. Select, design, and apply proper programs for individuals and for classes.